We’ve just released a new guide on how scholars and academic institutions can launch and support academy-owned open access (OA) journals. Get your copy here! Across academia, a movement is underway of university libraries, researchers, and scholarly institutions launching academic-led journals and flipping corporate-owned titles to academic-led models. Are you taking part? We’ve just released a free CC BY guide to help scholars and institutions navigate the many avenues for running academy-owned journals and facilitating community-led publishing models— The Essentials of Academic-Led Journal Publishing. You can download a copy here. The new Essentials of Academic-Led Journal Publishing guide is aimed at helping scholars and nonprofit institutions learn about the emerging academic-led publishing movement and the publishing processes, funding models, and tools being used to successfully run academic-led journals. Whether you’re currently working with academy-owned OA journals or just getting started, this guide will help you further your efforts. We’ve also included some resources you can use for academic-led publishing initiatives you’re involved in, including a checklist with what you need to know in the first month of starting a new journal, a checklist for publishing an OA journal on a budget, and a chart overviewing popular journal funding models. Additionally, you’ll find a list of external resources that you can check out to keep learning about academy-owned publishing and get support for projects you’re involved in. Why is now the time for academic-led publishing? Today, many scholars and institutions are concerned that the academy may not be able to fund the transition to OA should the big 5 corporate publishers remain in control of the majority of research. After all, OA only guarantees research will be free for readers; it does not guarantee that it will be affordable to the institutions paying for it. Scholars like Mark C. Wilson, OA advocate and senior lecturer in the Department of Computer Science at the University of Auckland, argue that OA publishing will not be sustainable unless journals are academy-owned. “The number one issue is journal ownership. Principle #1 of the Fair Open Access Principles is that we should have community ownership of journals, ideally among nonprofit organizations,” said Wilson. Like other scholars, including OA advocate Björn Brembs, Wilson argues that corporate publishers are inflating the price of OA publishing and will continue to do so unless control over research copyrights and production costs is shifted back to the scholarly community. With modern digitally-focused publishing approaches, the right tools, and community support it’s easier than ever for scholars and academic institutions to run journals. 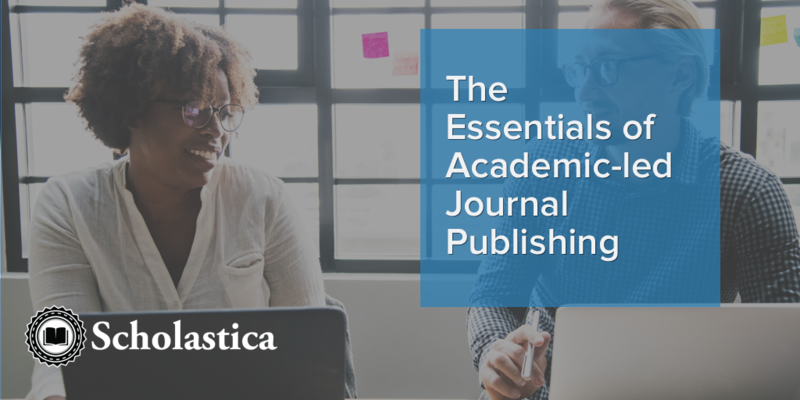 The Essentials of Academic-Led Journal Publishing will show you how. This guide is licensed under a Creative Commons Attribution 4.0 International License so anyone is free to share and build upon it.